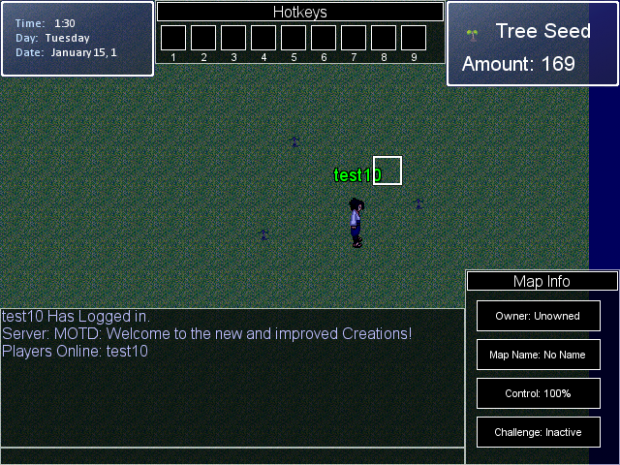 Creations is a 2D multi-player build-and-destroy game created with RMXP. Players are able to build structures while interacting with each other. Players are also able to create kingdoms in order to claim a map. Kingdoms can be used in many ways, and it's up to the players whether they will create a simple trade route, or make an empire and claim the world. If 2 kingdoms want the same land, they can challenge each other to a battle for the land. The entire world is in the hands of the players. Peaceful or violent, mining or farming, good or evil, the choice is yours. All Rights Reserved, game may not be copied or redistributed without expressed written permission from the creator. Violators will be prosecuted to the fullest extent of the law. Trees, the latest addition to Creations, can now be grown from seeds, which are randomly dropped from trees. These seeds take some time, about a minute, to grow, and are the first example of the new growth system. So what is this growth system? By taking advantage of the time system implemented in Creations, new crops will soon be added that an take different amounts of time to grow, and even have different stages of growth. Farming will definitely end up playing an important role in Creations and will greatly influence the economy. After all, you can't live without food. It's hard to get some good screenshots with this update, but I tried. I'll try to put together a video demonstration in the near future. In the mean time, stay tuned for exciting new updates! After I perfect the trees, I'll be moving on to other crops and then into making adjustments to tools as well as adding new crafting recipes. Plenty of updates on the way! And be sure to like us on Facebook, at www.facebook.com/creationsgame!! Finally, crafting has been added to Creations, along with several other features. Creations Update: Big Changes Coming Soon! Been a bit busy, sorry for no updates this week. Hang on! The trees are coming, the trees are coming! Technical Question On Gameplay (More to give other people an idea on the game) : How does this game differ from any other minecraft / terraria game??? Currently, a lot of the stuff in the game seems to be similar to Minecraft. At this point, what I'm trying to do is add some of the features common in Minecraft and Terraria to this. From there, Creations will begin to deviate and become a unique game. Although it is true that I received some inspiration for the idea of kingdoms through the Minecraft factions plugin, there will definitely be differences between the 2 systems. Additionally, some of the features that could normally only be achieved with plugins and mods in Minecraft will be part of Creations. My goal with Creations isn't to just make a game like Minecraft where people can build things together, but to create a unique multiplayer experience. I'm trying to add an emphasis on commerce, something really neglected in Minecraft. Just like how kingdoms in real life try to prosper, so will the kingdoms in Creations, and this can be achieved through simply farming and trading, or waging wars with other kingdoms. 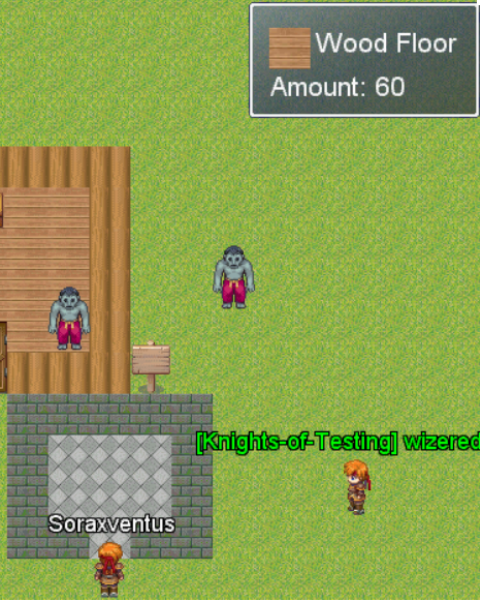 Another feature I'm trying to implement is an importance to owning certain land. In Minecraft, all the land is really the same, and the odds of finding diamonds are random. That won't necessarily be the case in Creations, as certain maps will have special characteristics. For example, rarely a map could be a "gold mine". When this happens, gold will naturally spawn in the area over time. This adds a value to land never really seen in other games. Kingdoms could wage wars just for maps like these, where being lucky enough to own a gold mine could easily make a kingdom prosperous, if maintained well. All in all, what I'm trying to say is that although Creations may seem like other games now, that won't always be the case. By taking advantage of the multiplayer nature of the game, Creations will offer a truly unique experience.